Bridgetown, Barbados, November 19, 2015 – Entrepreneurs have an additional avenue through which to learn and benefit from the insights and stories of successful businesses through a new radio series which starts next week during Global Entrepreneurship Week. The “Your Roadmap to Success” radio show will feature interviews with a diverse set of entrepreneurs spanning industries such as horticulture, business development, transit solutions, construction and green energy, and is designed to help entrepreneurs gain insights that they can apply to their own businesses. In the first show, listeners will hear from Khalil Bryan and Veronica Millington, Business Development and Marketing Leads of Caribbean Transit Solutions Inc., and Barbara Dennis, Managing Director of Pthree Business Development. The four-part radio series, which was recorded at Creek Productions, will be broadcast weekly on The Beat 104.1 FM on Tuesday mornings and on Y103.3 FM on Thursday mornings until December. The radio series is sponsored by Scotiabank and produced by Clearly Content Communications Inc. under UPstart Caribbean, the Public Education Programme (PEP) on entrepreneurship. Senior Manager, Marketing, at Scotiabank, Lisa Cole, said that the bank was excited about the radio series. “This is an initiative we’ve wanted to get off the ground for some time and we were happy to work with Clearly Content through UPstart Caribbean to do so. In business, there is so much to learn on a continuous basis, from building a great team to determining the best way to finance growth. We think that listeners will learn much from the entrepreneurs featured on the programmes, who can share their experiences of navigating their way from startups to becoming industry leaders,” Ms. Cole explained. 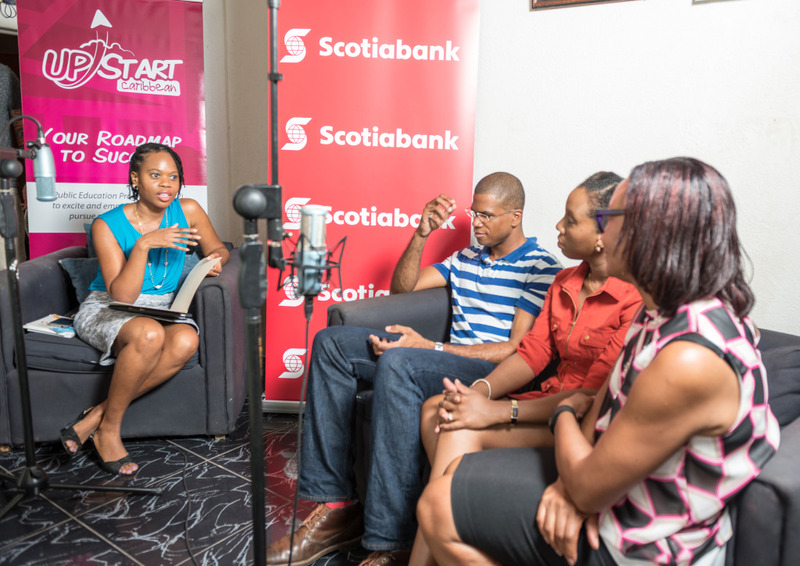 Scotiabank has a robust financial education programme for small businesses and is also the lead sponsor of the award-winning “Bank on Me” TV series. UPstart Caribbean was launched in June 2014 and is designed to excite and inspire more Barbadians to pursue entrepreneurship as a viable option. The programme successfully hosted a set of workshops sponsored by Scotiabank on starting and growing business; launched a website and Facebook page; as well as produced a series of success stories on regional entrepreneurs featured in ZiNG, Liat’s inflight magazine. Host of Your Roadmap to Success radio show and MD of Clearly Content Communications Inc., Heather Barker interviews other entrepreneurs about how they overcame their fears to run their own businesses: (from right) Barbara Dennis, MD, Pthree Business Development; and Veronica Millington, Marketing Lead, and Khalil Bryan, Business Development Lead, Caribbean Transit Solutions Inc. Managing Director, Clearly Content Communications Inc.